Will Morsi hijack the revolution? EGYPT IS facing one of its biggest political crises since the 2011 revolution that toppled dictator Hosni Mubarak as more than 100,000 people protested November 27 in Tahrir Square against President Mohamed Morsi’s bid for virtual dictatorial powers. The crisis was triggered November 22 when Morsi issued a decree placing himself beyond the review of the country’s judiciary. He barred judges from overturning actions by either the Shura Council, the upper house of parliament, or the Constituent Assembly, the Islamist-dominated committee charged with writing a new constitution. To give his move the trappings of the revolutionary, Morsi fired the country’s top prosecutor–a hated holdover from the deposed Mubarak dictatorship–and promised to put on trial figures from the old regime who were implicated in the killings of activists during the revolution. Morsi finds himself embroiled in a battle–with leftists, liberals, socialists and several other influential political sectors… In rallies that remained largely peaceful, thousands took to the streets in Cairo, Alexandria, Assiut, Tanta, Mahalla, Mansoura, Luxor, Suez and Port Said, in scenes reminiscent of last year’s 18-day uprising that unseated autocratic leader Hosni Mubarak. The Nile Delta city of Mahalla, however, witnessed clashes between Morsi’s supporters and opponents in front of the office of the Muslim Brotherhood’s Freedom and Justice Party (FJP). At the Tahrir Square protest on the 27th, striking lawyers and judges joined students and youth affiliated with the revolutionary camp. Attacks on protesters by police–which began last week in Tahrir Square demonstrations that were previously organized–have at times been fierce, but were apparently minimal at this mass rally. Protesters are calling for another million-person protest on Friday. Whether the opposition can muster such numbers remains to be seen. But the November 27 demonstration reflects the breadth of opposition to Morsi’s bid to dominate Egyptian politics through the FJP. IN FACT, the office of the president had operated largely unchecked since Egypt’s top court earlier this year invalidated the elections to the lower house of parliament. Now, Morsi is asserting the right to ignore court rulings against his legislation, effectively placing himself above the law. His move also makes it possible for the Islamist-dominated Constituent Assembly to devise a new constitution that would entrench the FJP in office. Significantly, the textile workers of Mahalla, whose years of struggles set the stage for the 2011 revolution, announced strike action in solidarity with the protests. That’s an indication that some of the most organized and politically advanced workers are willing once again to use their economic and social power to confront the government–just as they did when Mubarak was forced from office. The response of Morsi has been to try and package his autocratic powers with soothing rhetoric, but without backing down on his decree. The Muslim Brotherhood canceled its planned pro-Morsi rally for November 27 in an effort to avoid violent confrontations with opposition activists. In Alexandria, however, the Brotherhood and more conservative Islamist forces did take to the streets–many of them likely looking for revenge for the burning of the FJP offices last week amid anti-Morsi protests. And it’s certain that Morsi will mobilize his supporters to try and portray himself as a popular and legitimate leader. Morsi and the Muslim Brothers have returned the police to the Egyptian street, not for traffic control or security for the neighborhoods in service of the people, but to break up the sit-ins and the strikes, to arrest those who lead them and to bring back torture and killing to terrorize the masses. First, by playing a central role in brokering the cease-fire that ended the Israeli war on Gaza, Morsi gained political prestige at home and abroad–and thus was seizing the opportunity to make his boldest move yet. By dispatching his foreign minister to Gaza amid Israel’s aerial assault, the Egyptian government provided a starkly different image to the Mubarak collaboration with Israel. The U.S. had to lean on Morsi to influence Hamas, and the State Department heaped praise on the Egyptian government. The U.S. has therefore muffled its criticism of Morsi’s actions and shows no sign of curtailing its $1.3 billion in annual aid to Egypt. Second, Morsi has, for now at least, sidelined the military as a political force. By forcing Egypt’s top generals into retirement, Morsi established an alliance with a younger generation of officers who’d been impatiently waiting for the brass to move on. Certainly military leaders are concerned that their dominant political role has been eclipsed. At the same time, however, Morsi’s policies have assured the military that most of its traditional prerogatives will remain intact. Thus, the military intelligence chief, Mohammed Shehata, was a central player in the negotiations between Hamas and the Israeli government, which reassured politicians in Tel Aviv and Washington. Moreover, there are no indications that the military will have to surrender its vast economic interests, which include everything from munitions manufacturing to household appliances to luxury resorts. Third, Morsi knows that Egyptian capitalists see rule by the Muslim Brotherhood as a lesser evil compared to further revolutionary struggle and the radicalization of the Egyptian working class. Some corporate bosses in Egypt weren’t entirely comfortable with the crony capitalism surrounding the Mubarak regime, and they dumped him once workers joined the revolutionary movement en masse. Now they’re taking a wait-and-see attitude as Morsi’s government secures a $4.8 billion loan from the International Monetary Fund as part of a total $14.5 billion in lending from a variety of sources. Egyptian bosses will also be reassured by the Muslim Brotherhood’s long-standing embrace of market capitalism. Fourth, the Muslim Brotherhood wants to lock in its political dominance while it can. It is by far the best-organized political force in Egypt, and Morsi wants to use the Constituent Assembly to write a constitution that will increase the Brotherhood’s weight. By integrating elements of sharia, or Islamic, law into the constitution, Morsi aims to cement the loyalty not just of Muslim Brotherhood stalwarts, but also of the more hard-line Salafist elements, who have made scapegoating the Coptic Christian minority central to their organizing. 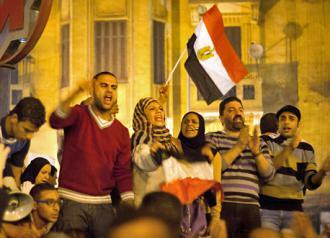 Fifth, the Muslim Brotherhood reckons that the opposition is too divided to mount a serious resistance. By firing Chief Prosecutor Abdel Maguid Mahmoud–a demand of the revolutionary camp since the day Mubarak fell–Morsi calculates that he can burden the left with defending one of the most despised figures in Egyptian politics. That way, Morsi reasons, he can have his cake and eat it, too: the Egyptian president can try to place himself beyond democratic accountability and yet portray himself as the real revolutionary by ordering new trials for some of Mubarak’s old henchmen. Moreover, the opposition is divided between pro-market liberals and the left, which is demanding an increase in the minimum wage, anti-poverty programs and job creation initiatives. ALL THIS would seem to give Morsi overwhelming advantages in his efforts to amass power. His model and mentor is Turkish Prime Minister Recep Tayyip Erdogan. Erdogan’s Islamist Justice and Development Party has been able to reorient Turkish politics away from a military-dominated system toward freely elected governments that combine an appeal based on Islam with urban political machines led by the aspiring middle class. Erdogan hasn’t upended the Turkish state, as some old guard military chiefs feared, but he has instead used Islam to give it a new popular legitimacy and fortify the Justice and Development Party’s political position. Mr. Morsi’s inheritance, practically intact, of Egypt’s vast bureaucratic pyramid also magnifies the Brothers’ influence. State-owned radio and television have seamlessly switched from adulation of Mr. Mubarak, then of the generals who succeeded him, to praise of Mr. Morsi. Businessmen seeking influence or government contracts now cultivate friends in the Brotherhood, making sure to be seen at fraternal funerals and weddings. Control of the ministry of education gives the Brothers authority not only over state curricula, but over its 1 million-plus employees. Their influence in the ministry of religious affairs, which oversees some 60,000 mosques, has discomfited Sufis, who fear the imposition of more rigid orthodoxy. The only remaining checks on Mr. Morsi’s power are Egypt’s courts, its independent press and public opinion. And now, if Morsi’s decree holds, the courts are out of the way, too. There are big differences between Egyptian and Turkish conditions, however. Turkey’s long run of strong economic growth allowed Erdogan to expand his political base even after he was blocked from forming a government by a “soft coup” by the military in the 1990s. Today, even Turkish nationalists and secularists are mollified because they’re making money–which has enabled Erdogan to slowly cajole the military into its barracks. Turkey’s membership in NATO and its attempts to join the European Union, moreover, has further restrained the military from intervening politically. By contrast, Egypt’s economy is weak and on the edge of catastrophic crisis. Some 40 percent of the population lives under the poverty line. Many scrape by on government subsidies on food that, in 2011, were the equivalent of 2 percent of gross domestic product (GDP). Government fuel subsidies account for 8 percent of GDP. Sooner rather than later, Morsi will be obliged to follow the usual IMF edicts and roll back those subsidies–a politically risky move at any time, but potentially explosive during a revived strike wave. In fact, the government has already been losing popularity due to its incompetence in running basic social services such as transportation. A pro-market economic “reform” program is bound to lead to a sharpening of class struggle, forcing workers to confront not just employers, but the government itself. Central leaders of the [Muslim Brotherhood] organization, such as Khairat Al-Shater and Hassan Malek, are millionaire businesspeople. Other key business leaders associated with the MB include Safwan Thabet of the Juhayna group, Egypt’s largest dairy and juice company; Mohamed Moamen of Mo’men Group, which operates the largest Egyptian fast-food chain; and Abdel Rahman Seoudi, who runs a supermarket chain and agricultural export company. These individuals completely control the organization’s decision-making process (through the so-called Guidance Bureau) as well as its economic program. They have made it clear in numerous interviews that they support continued privatization, increased exposure to global financial markets, further deregulation of labor markets and more reliance on loans from international financial institutions such as the International Monetary Fund and World Bank. For this reason, much like its cousin, the AKP in Turkey, the Egyptian Islamist movement can be understood as the political expression of a (growing) segment of the country’s bourgeoisie. Egypt’s private capitalists may yet clash with the state capitalist sector. But Morsi’s support from the IMF and a group of private lenders will create pressure for free-market reform. Egyptian workers, however, will do no better under such a program than their counterparts in Eastern Europe and other countries where state industries were sold off to private investors. Now Morsi’s move to centralize power has put the question of a second revolution squarely at the front of Egyptian politics. The struggle will continue.